I set a goal to find and interview 6 pilots with their Antique and Classic Airplanes this summer and my prayers were answered in spades. Some of the interviews could be done in one long day and others took more than one day. H. Cameron Blazer III of Leawood, Kansas – known to all as “Cam” – agreed to be my sixth and final interview of the 2010 flying season. Our two days together at the Gardner Municipal Airport were but another high point in a great series of meetings this summer with the keepers of the Classic Airplane Flame. 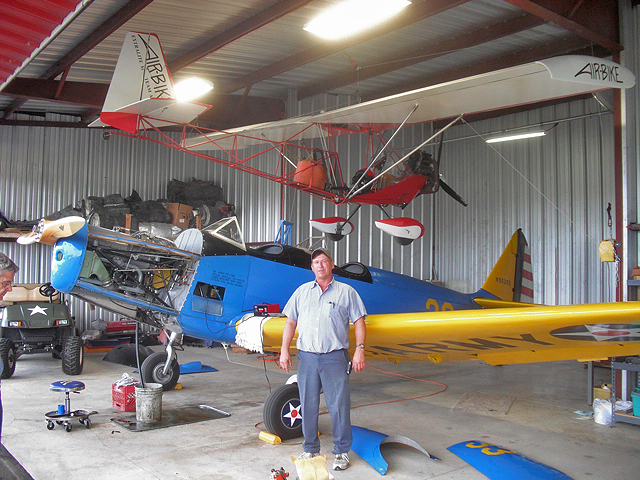 Cam has lovingly restored a 1936 Monocoupe Model 90A. Like so many of the airplanes of that period, its styling reflects America’s great contribution to the World of Art – Art Deco. It looks like it should be only shown on a pedestal. Besides receiving numerous awards for the Monocoupe restoration work, Cam is also famous for being Kansas City Project Manager for the Sprint Center – a large, multi-use indoor arena in downtown Kansas City, Missouri. The building is located at 14th Street and Grand Boulevard and is notable for being completely encased in glass. It is unlike any other building I have seen. Check it out with the link above. It is the keystone of the city’s revitalization program. One of the interesting features of Cam’s Coupe is its external wind-driven generator. In order to simplify the electrical system, wind generators of this sort were used by a variety of manufacturers in this era. The propeller can be braked to a stop when electricity from the generator is not needed. Here Cam shows the Monocoupe factory logo – a formation of Teal making a beeline. 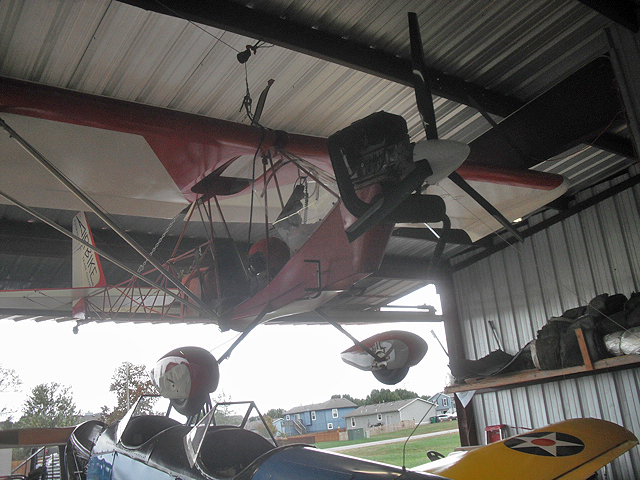 The 90A came with a Lear Radio so another unique attribute of the Monocoupe is its drogue chute deployed antenna. In flight it is wound out by an overhead reel to the length required by the frequency chosen. Cam says you want to remember to reel it in before you land. Because this tailwheeler suffers from the dead spot ahead that all tailwheel aircraft do, Cam always taxis with his door open leaning out to see ahead. This is how I like to see these Classics – gliding across the grass, itching to take to the air. The Warner SS165 Radial up front has a pleasing sound as it pulls the Coupe to takeoff speed. I found it a very smooth sounding and surprisingly quiet motor as he passed by me. The plane has a very respectable climb rate. I really like the way the bright yellow stands out against the foliage and houses in the background on this head-on flyby shot. We definitely wanted to show the Lear Radio antenna extended, so Cam cranked it out for a pass. I like this shot because it portrays the speed of this 30’s racer. Cam tells me they also clipped the wings on some versions of this plane. These are just a few of the many things I learned while talking to Cam Blazer about his ’36 Monocoupe. It was a great two days at the famous Gardner Municipal Airport. Now I have a few months of editing to do before I can release the finished product. I am going to make these six interviews and a few sidebars I have developed into the first two parts of an on-going series on Antiques and Classic Airplanes. They will be available on Blu-ray and DVD. Be looking for an announcement this winter or no later than spring 2011 for their release. The second day I came up to Gardner we shot all the aerial footage and some ground handling shots. Having started pretty early in the day by the time we finished it was lunch hour. Cam and his buddies have a haunt with their own table so we headed over there. I was following Cam’s car and as we were leaving the airport he saw one of said buddy’s hangar door open. He pulled us back around to say hi. It was Karl Hines who was performing some maintenance on his PT-19. Karl was thinking lunch would be a good idea, too, so he joined us. In addition to his 1943 trainer I noticed a somewhat familiar sight hung against the rafters – a TEAM Airbike. Two of my friends own these: Doug Moler of High Point, Kansas and Paul Fiebich (a.k.a. “The Airbike Ace”) of Derby, Kansas. But even though the distinctive Airbike logo looked the same as theirs, something seemed unusual about this plane. 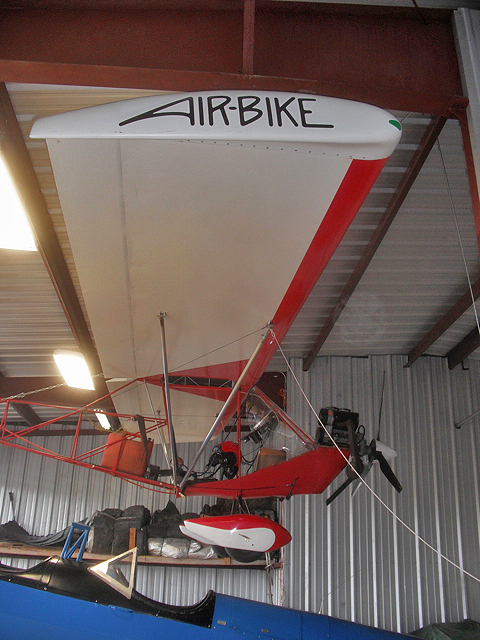 Come to find out, it IS different from Doug and Paul’s planes because Karl’s Airbike is the first one ever made. Ensuing models have been changed in a variety of ways. I couldn’t get back far enough for my camera lens to get the whole “Bike” in the shot from the front and side. So, I took the next two shots to isolate some areas so you Airbike aficionados can get a look at some of the differences. Now the engines are mounted inverted. This first permutation of the Airbike line featured an overhead “look-see” port. When I get started on my interviews again in the Spring I’ll be calling Karl. We gotta learn more about his PT-19 and see it in the air!